There is no denying that the job market can be difficult to break into. This can be especially true for those coming over from the military to civilian jobs for the first time. You should know that there is a high level of competition for most jobs, and to land the job you are seeking, you have to stand out from the crowd. To accomplish this, you need an exceptional resume that catches the attention of readers and portrays you in the best light. One of the best ways to make sure your resume is as strong as it can be is to review military to civilian resume templates. This short guide explains some of the common resume writing strategies, as well as everything you need to know about finding and using a resume template. Why Use Military to Civilian Resume Templates? When you make the transition into civilian jobs, you need to present yourself as professionally as possible. There are many features you can include in your resume to emphasize this aspect of yourself specifically. There are professional resume templates to show you what you can include in your resume to make you appear even more qualified. In modern hiring processes, hiring managers commonly use a computer to screen through the resumes they receive before reviewing them personally. If you want to have a chance of getting the job, you should use the modern military to civilian resume templates to create a resume that will make it past automatic machine screening and into the hiring managers’ hands. If you are going from a military job to a civilian job, that is one of the biggest career changes possible. There are career change military to civilian resume templates to help you emphasize the right aspects for this change. A well written resume will use the career change as a positive aspect to improve your chances of landing the job. If you are starting a new civilian job, there is a good chance you are applying for entry level positions. Entry level resumes are actually quite different from resumes written by professionals with years of working experience. 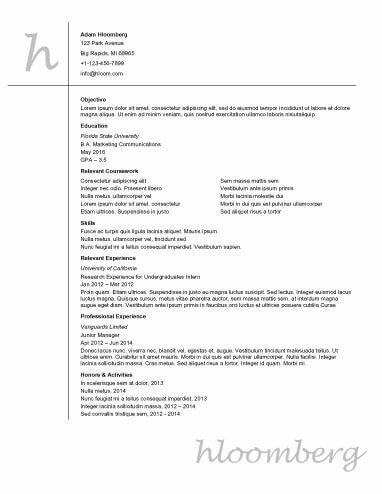 Learn how to make your entry-level resume as strong as possible with this entry-level resume template. As you can see from these military to civilian resume templates, the most effective documents are only one page long. However, it is best to include two or more pages on certain occasions. Generally, you should have one page for every 10 years of working experience you are representing on the resume. You can learn more about the ins and outs of resume length with these one-page resume templates. While military to civilian resume templates are an amazing tool to help you create the best resume you possibly can, you may still be feeling uncertain about how to start, even after reading multiple templates. Luckily, there is one more tool you have available to you: the resume builder. A resume builder guides your writing in a more direct way than a template. This makes it much easier to create resumes that will stand out from the crowd.